This summer has brought us some downright hot days. And we have retreated to the air conditioning. Which has brought me back to a project that never really got finished. The kid’s dollhouse. Now they have been playing with it! But I always had intentions of adding more fun things, and since my littlest has taken a big interest in it lately it seemed like a good time. It was scrap buster time. My kids love digging in the scrap bucket so I sent them over for pieces that they loved. Cut your scraps into long strips. I was working with fairly small pieces so I joined pieces together with knots to get three long strips. Try to vary the length of your strips so the knots on the three strips aren’t hitting in the same place. This can get really bulky. Join the top of your strips with a knot. Keep braiding! Work the knots in as you hit them. I trimmed the long tails of the knots later. The rag rug look isn’t perfectly manicured so I embraced the threads, fraying edges, and bumps here and there. You can take breaks and test roll your braid to see if you’ve hit the size you’re looking for yet. Once you’ve hit your desired length with the braid set that aside. Grab a piece of felt and cut it to the shape and size you want your rug to be. I used a bowl for my template! Heat up your hot glue gun. Put a big dob of glue at the center of your felt template and nestled that starting knot into it. Then work your way out in circles. Laying a line of glue and securing one circle of braid at a time. Work in your knots as you go, and try to make sure your braid is laying flat and not on its side. When I reached the end of my template I opened up the end of the braid and wrapped the three strips to the back and glued them down flat. I left mine at that, but you could take another strip and run it along the outside edge of your rug sandwiching your layers together. Easy- Peasy! How about one more quick addition to the room? I’ve been picking up little furniture here and there. I’m still deciding how I’ll finish it all, but I have these little chairs that could use some cushions. So I made a quick little chair cushion. Go back to your scrap pile and grab a piece you didn’t cut into strips. You can use the chair itself for a template. Draw around the seat of your chair. Remember seam allowance! I eyeballed in 1/4″. Cut 2. Put your two seat cushion pieces right side together and around 3 sides. Leave the flat edge that will touch the back of the chair open. I put in just a little stuffing to give it shape. Then tucked the raw edges in and stitched across the back of the cushion. I grabbed my embroidery thread next. I used a four thread chunk of embroidery thread to create two ties for the chair pad. Cozy chair all ready to go! Do your kids have a dollhouse? What was your favorite project to make? I’m always looking for inspiration and collecting it on Pinterest. 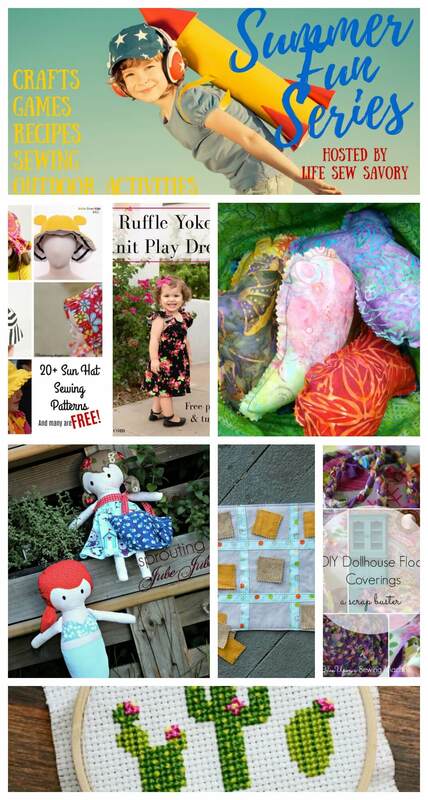 Want to find more fun summer sewing? Check out the posts below. How cute!! I’ve made a full size rag rug, but this mini one is just adorable. Thanks for sharing at the summer fun series! In making the rag rug out of fabric strips for my dollhouse, how wide are the strips?